Most bloggers that I know of, like me, are also busy mums to sweet cherubs, and like myself all of them agree that their blog too is one of their children. Why not, you love, nurture and cherish your blog much like you would your own child. Much like our daily thought process goes into planning ahead for the days regular activities, so does "What do I put up on my blog next?". After all it is a labour of our love. Last week as this very thought oscillated through my brain, a light bulb flashed through!, and the best part of it all was that it blended in perfectly with my principle of using up leftovers. If you are a regular reader of this blog, you would know that I made a big batch of Orange Marmalade two weeks ago, and after thoroughly relishing it, then some more and sending half of the batch to my mothers, I still had half a cup sitting idly in the refrigerator, sticking out like a sore thumb. Something had to be done, but what? Incorporate it in a dessert? Naa... not after mentally chiding myself for the umpteenth time to steer clear of desserts for a bit and explore untapped territories. 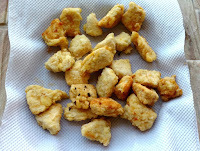 That's when it struck me, that the pages of my younger child a.k.a this blog have never been graced with any Oriental recipe. 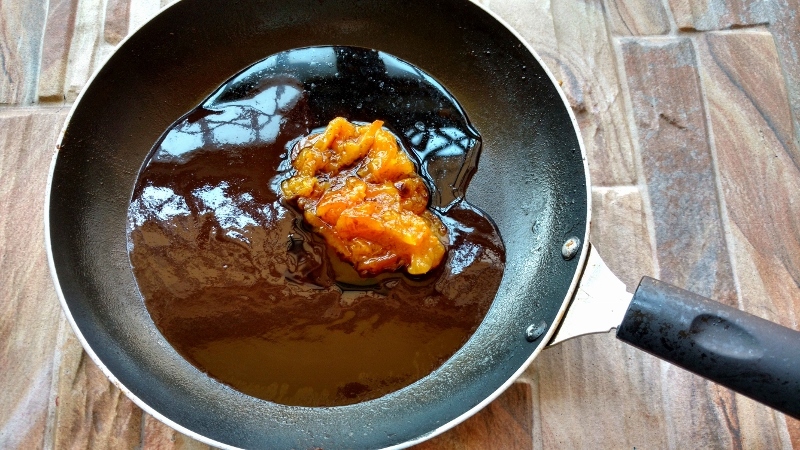 Marmalade would guarantee a nice sticky texture to any dish, but it couldn't be used as the main base, so then what? It was Barbeque sauce to the rescue, just because I already had it on hand. But two sweet sauces meant having a dessert for the main course, so what next?, Ah chili paste! perfect!. Fundamentals in place I set out to create a soul pleasing, tummy approving, sweet and spicy comfort dish that I have happily christened Fiery Marmalade Chicken. 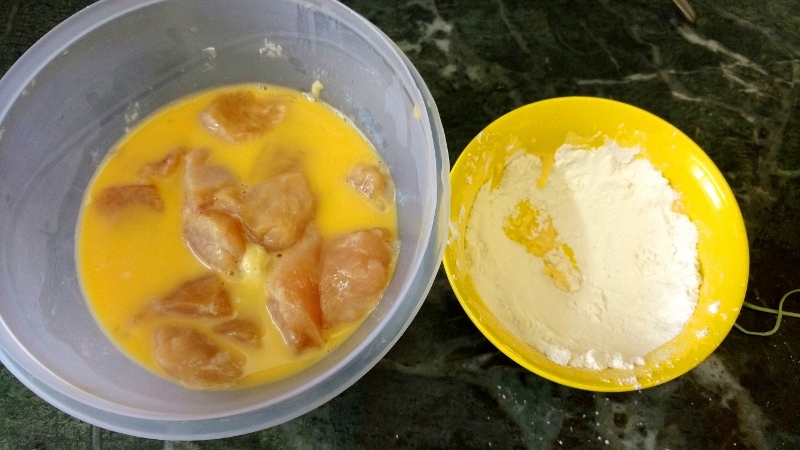 Start by dipping the pieces of chicken in a beaten egg, and then roll them in a mixture of flour and cornstarch. 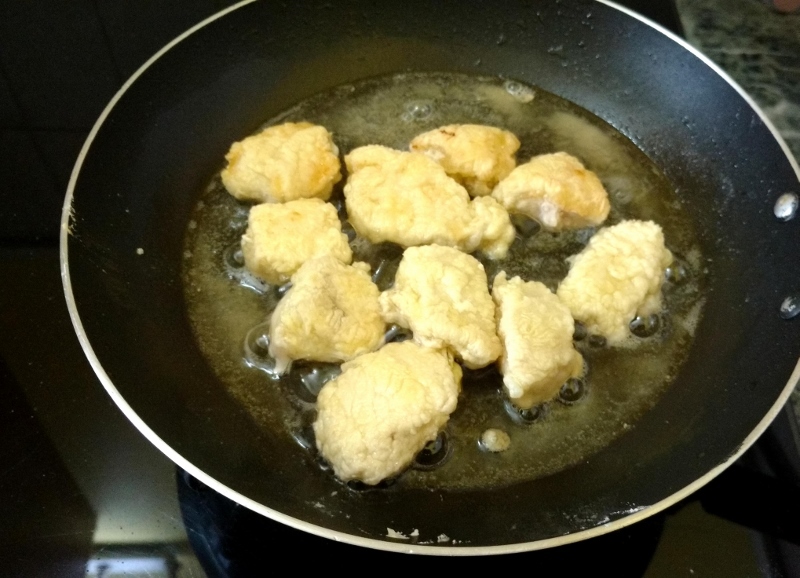 Now shallow fry the chicken pieces in medium hot oil, for 4 mins on each side. Remove onto a paper towel to drain off the excess oil. In another pan heat 1 tbsp of oil and add in the garlic and chili paste, saute on a low flame for a minute. Next add in the barbeque sauce, marmalade and soy sauce, mix well and allow to cook on a low flame for 10 mins. Once the mixture thickens slightly, turn off the heat and add in the fried pieces of chicken. Coat all the pieces evenly with the sauce. Transfer into a serving dish, garnish with freshly chopped greens of a green onion and sprinkle with roasted sesame (til) seeds. Serve hot on a bed of steamed rice or noodles.